Make Coming When Called Fun! Come is a serious behavior. We want our dogs to come to keep them safe and to keep us sane. Why should we make it more fun? Shouldn’t they just listen to us? Shouldn’t they come just because we say so? Well, perhaps in an ideal world, yes, it would be easiest if they came for no other reason than because we asked. And every now and then a dog comes along that does just that with very little training. But for most of our dogs, teaching a solid recall takes either a lot of work, or a lot of play. So why not play your way to a great recall? 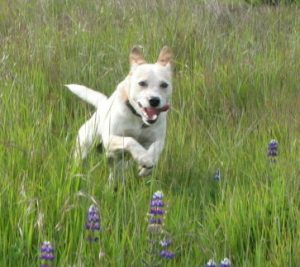 When you make “Come” part of the fun stuff in life, your dog is more likely to want to come—even when he is interested in something else. The key is to make coming when called the best part of your dog’s day. Here are some ideas on how to make that happen. Call your dog to you to start the good stuff. Say, “Come” and have your come to you (even just from the end of the leash) before you snap off the leash for play. Start your dog’s favorite games with come. Say, “Come” and when your dog gets to you, toss a favorite toy or play a great game of tug. When you’re about to give your dog dinner, call him to you! Call your dog and send him back to play or explore. Yes, really. When you call your dog to you and reward him for coming (let’s say with steak), and then he gets to go back to what he was doing, you’ve just taught your dog that coming to you is great, and it doesn’t mean the end of fun! Do this with 90 percent of your dog’s recalls, and I promise your dog will love coming to you no matter what else is going on. Make your rewards count! Coming when called is one place where you reward your dog above and beyond his expectations. Great rewards—steak, tug games, getting to run and chase you, or getting to do something else he loves—make for great recalls. Train with games. Games are a great way to practice your recall and to build enthusiasm. Here are just a few ideas for you. Hide and seek. Have your dog stay in one place or have a friend hold him while you find a quick hiding spot. Call “COME find me” (emphasize the come). When your dog does find you, have a welcome party, and reward abundantly. This game helps your dog learn to look for you when she hears the word “Come.” Keep this game fun, upbeat, and full happy reconnections. These are just a few ideas for you. How do you train “come”? What do you do to help your dog know that coming to you is the best part of the day? I’d love to hear your thoughts. « Excitable Dogs Can Learn Impulse Control!